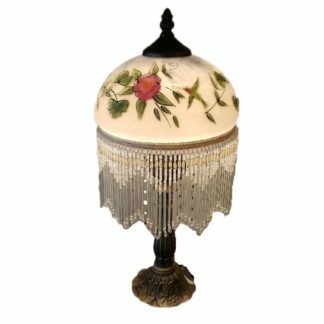 Hand painted pink flowers and butterflies adorn this charming fringed glass shade which is matched with a mahogany bronze finished lamp base. The flower mini lamp is a romantic way to add light to your room. Cosmos Gifts 8″D Lamp/Butterfly Table Lamp. While the details of this Cosmos mini table lamp are complimented by neutral tones and traditional styling. Also the footed and turned base gives way to a crisp white candle sleeve that disappears into the painted glass dome shade. The rose painting has been paired with fringe detailing for a touch of added Victorian flair. 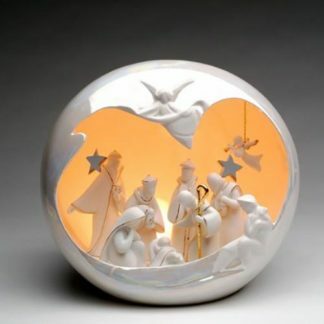 Measures about 8″ wide x 17.5″ Tall. Stop by today and check out all the great lamps and lighting we have in stock for you to choose from. 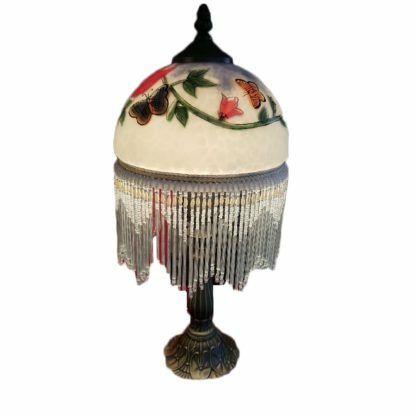 We also have the Tiffany Style Hummingbird And Rose Fringed 8” Table Lamp on hand.